Looking back, I wonder how many years it took me to learn the proper pronunciation of "requiem," which of course I assumed sounded like "requeem." This is the issue that got me back into reading comics, though not until finding a discarded coverless copy in someone's trash nearly a year after it first came out. Doctor Strange had been a favourite character of mine from early on, so that was probably the initial attraction. What really blew me away, though, was Englehart's intelligent writing, which seemed to me a notch above anything I'd seen before in comics, and Brunner's art, which IMO has never looked better than it did here. 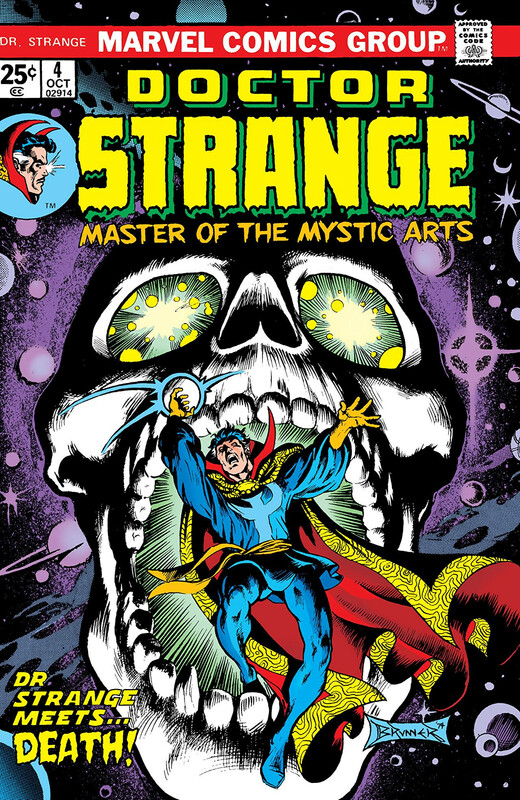 I'd been mostly reading books during the few years I'd been away from comics and it was Doctor Strange #4 that made me realise there were comics out there that were as well-written as many of the books I was reading. Pretty soon I began to find out which writers I liked and to follow them in addition to favourite characters or series. 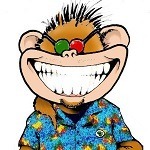 This comic introduced me to so many different things that went on to shape my comic habits and likes. It was my first real exposure to Kirby's Fourth World, sent me out to find Amazing Heroes #100 and ignite my abiding adoration of all things Kirby, especially the Fourth World. It introduced me tot he Phantom Stranger for the first time, who has gone on to be one of my all time favorite DC characters. It was my first exposure to the work of John Ostrander, a creator whose work I follow regularly to this day...and later in the series the Suicide Squad and the new Justice League, but this issue was the springboard to it all, and was the entry point for me to feeling like the DCU was as accessible to me as the MU had been growing up. I was mostly a Marvel zombie getting random DC issues here and there (as seen from earlier days of the book), but this was me becoming a full fledged DC fan after catching the end of Crisis and following the JL Detroit team. I love that run of Brennert stories. The one with the earth 2 robin just missed my list. I love that Brennert story that he did in Daredevil right after Miller left. He should have been given that title instead of Denny O'Neil. I saw Alan Brennert's name on an episode of the New Twilight Zone. He might have been involved with TV as his first job. On the sixth day of Christmas, my collection gave to me.... 6 galaxies exploding! I won with this cover recently in the classic cover contest and I was oh so happy because it is easily in the top 5 covers that I own. Captain Marvel is a unique character, one who I consider my third favourite behind the juggernauts Spidey and Batman. I never really enjoyed the aspect of space based heroes (Superman and Green Lantern just have yet to appeal to me) but Captain Marvel is different. I honestly prefer this incarnation of his costume...the green was something different and some may say it was a bit corny but I liked it. Even when he connects with Rick Jones, which is a bit strange, it is a concept that takes DC's Captain Marvel and makes it more interesting for me. The original series is under appreciated in my opinion. 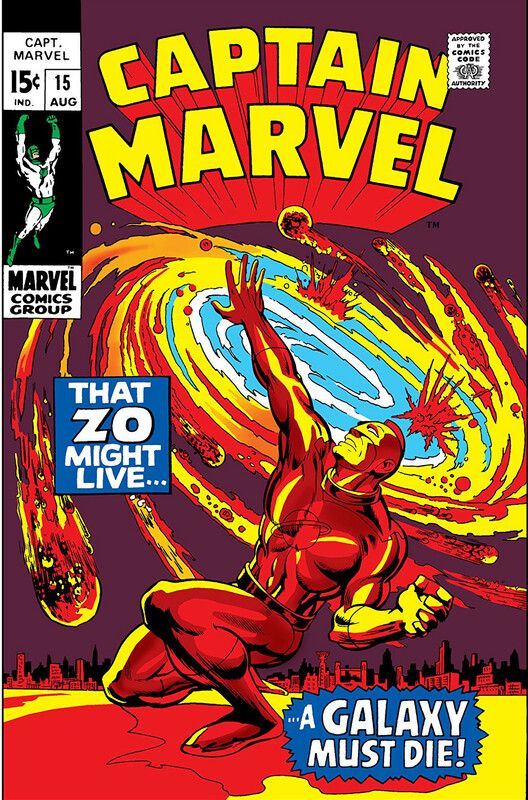 I am still on the lookout for the Death of Captain Marvel (which I know will be great when I do get it and read it) but as a representative for my third favourite character, this fits the bill perfectly. Plus, Marie Severin...another under appreciated artist and a pioneer in the industry as a female. Her best work is this cover and it deserves to be celebrated. Which would turn "Requiem for a Dream" into a rhyme ... maybe they should pronounce it that way! Marvel's Captain Marvel is a rare example of a character that was invented purely for business reasons but that works anyway. I think the reason for that is that they came up with a really interesting concept: a Kree soldier serving on Earth who finds himself more and more compelled to defend his enemies, often against his own compatriots. It's as if Captain America were serving in Vietnam and found himself more and more fighting on the side of the Vietnamese. That kind of internal conflict is inherently fascinating, can make the reader question some deeply held assumptions, and can generate all kinds of stories. Good job, whoever came up with it. Jesus, folks, how do I pick a single issue of 'Cerebus'? 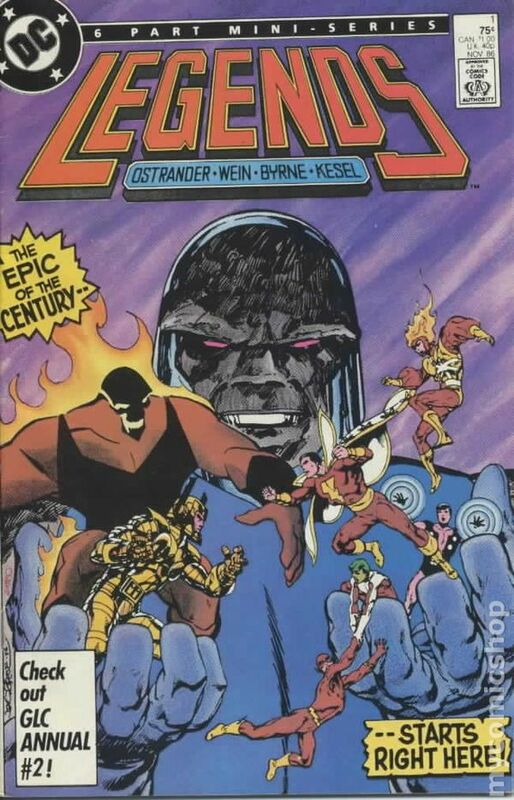 If you told 7 year old me that DC would be publishing a JSA comic that he didn't want to read, he'd call you a liar right to your face, but if you told 20 year old me that he wouldn't want to read 'Cerebus' much further beyond the halfway point, he'd give you a look like you were trying to teach a great dane calculus. Because for DECADES, Cerebus was one of the smartest, funniest, wittiest, most interesting and gloriously executed comics in the world. 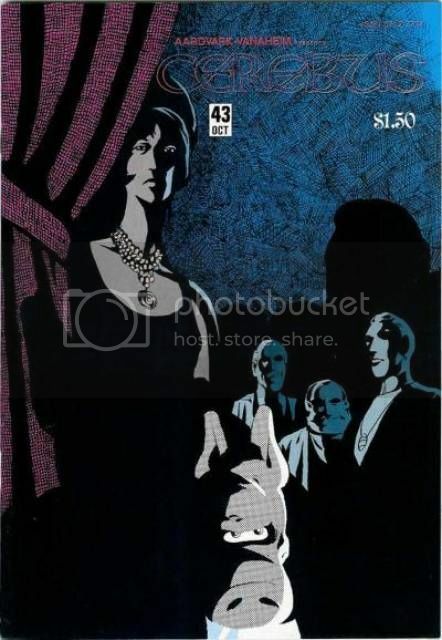 So yeah, I knew I had to pick something from 'High Society' and this is the one: 'Cerebus' #43 (October, 1982). This is right in the middle of the election storyline, where Cerebus is running for Prime Ministership of Iest, and is being challenged by the former Prime Minister, Lord Julius (a spectacularly executed Groucho Marx pastiche)'s chosen candidate, a Goat. First up, not only does Dave Sim write a note-perfect Groucho (something MANY excellent writers have attempted and failed), but secondly, he makes the process of electioneering stupidly funny and clever. The headlines from Rival newspapers (one backing Cerebus, the other backing the Goat) are some of the sharpest and cleverest political satire I've seen. Thirdly, I had to choose SOMETHING from 'Cerebus', and 'High Society' contains some of the series best, cleverest and funniest moments. Plus, when I grew up, my dad hated The Marx Brothers, so I have Dave to thank for making me want to seek them out. Exactly! The fact he rebels against his own race because of their ways is a unique aspect. I also think the artwork on the early issues is fantastic for the time period. Plus, it sort of rips of DC's Captain Marvel by having the whole connection with Rick Jones which I find to be much cooler than Shazam/Captain Marvel as a child that turns into a superhero. Deleted entry: I already posted here previously! Sorry! I see this actually made someone else's list (Calamas on Day 9). That summary describes a lot of what I like about this issue, too. I agree that it's remarkable how Joe Staton replicates various artist's style to depict various scenes from Carol Ferris's history. Green Lantern was the first super-hero series I collected regularly, and I considered various issues of the great Englehart/Staton run on my list. But a big reason why this one made the cut is that it was a great introduction for a new reader. Like the Jean Grey funeral issue from the Claremont/Byrne run of Uncanny X-Men, it uses flashbacks to give the reader a view of many past stories. 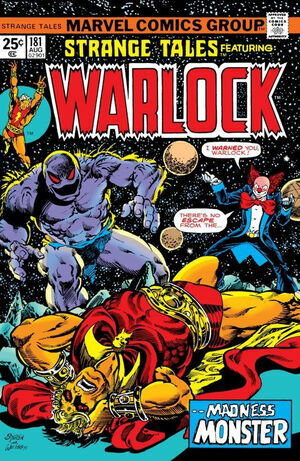 This issue story stoked my interest to read past issues and unravel years of stories.